Ambrose Bierce was a well-known and highly admired journalist, short story writer, and satirist. After distinguished Civil War service, Bierce became a journalist, and in 1887 he became a columnist for William Randolph Hearst’s Sunday Examiner. His work for the San Francisco Examiner made his reputation, especially on the West Coast. In 1914 he vanished on a trip to Mexico. The work for which he is best know, The Devil’s Dictionary, was first published in 1906. Bierce also published volumes of short stories. His Tales of Soldiers and Civilians (1891) represents some of the finest writing to come out of the Civil War. Bierce’s stories of the supernatural, collected in Can Such Things Be? (1893), established him as one of the leading American authors of supernatural fiction. This volume gathers together for the first time the 850 fables written by Bierce over his forty-year career, including more than 400 fables never reprinted from the magazines and newspapers in which they originally appeared. Bierce’s fables are distinguished for their biting wit and their cynical reflection of the political and social events of his time. Local and national political figures; corrupt lawyers, judges, and clergymen; and even incidents in the Spanish-American War are all mercilessly lampooned. The fables not only testify to Bierce’s hatred of “hypocrisy, cant, and all sham” but provide a window into late nineteenth-century American society. 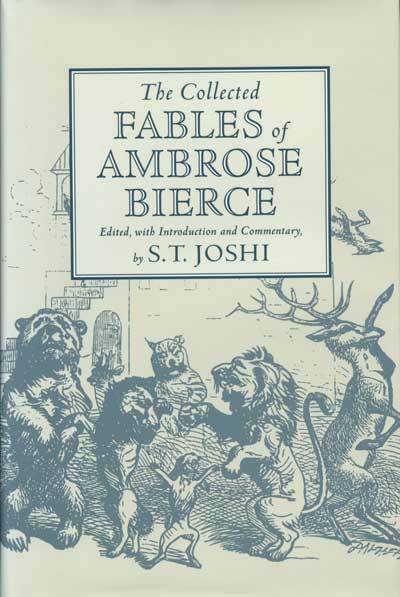 S. T. Joshi has provided extensive commentary explaining historical and literary references in the fables. S. T. Joshi is an author and editor living in New York City. He has written and edited many books, including Ambrose Bierce’s A Sole Survivor: Bits of Autobiography.